Following the performance of Peter Pan Live, NBC is returning to the musical well on Dec. 5 with How Murray Saved Christmas , a new cartoon holiday classic. Sean Hayes plays Edison Elf, the tiny but inventive little helper that will enliven Murray's Christmas spirit. Unfortunately, he's also the elf who takes out Santa with an errant punch, forcing everyone to come together and find a replacement — that comes in the form of deli store owner Murray Weiner — who can fly around the world and deliver Santa's billions of Christmas gifts in time. While Murray doesn't end up doing things exactly the way Santa would, what kind of Christmas movie would this be if he didn't end up succeeding in his own way? Spoiler alert: Christmas is probably saved by the end of the movie. Creating the perfect cinematic Christmas elf, like Will Ferrell's Buddy in Elf, it's equal parts loud, manic energy and an open heart. And with Santa out of the picture, the holiday cheer is resting on Edison's tiny shoulders, especially since Murray is such an old grump. The casting for How Murray Saved Christmas is perfect. Jerry Stiller as a grumpy old man? 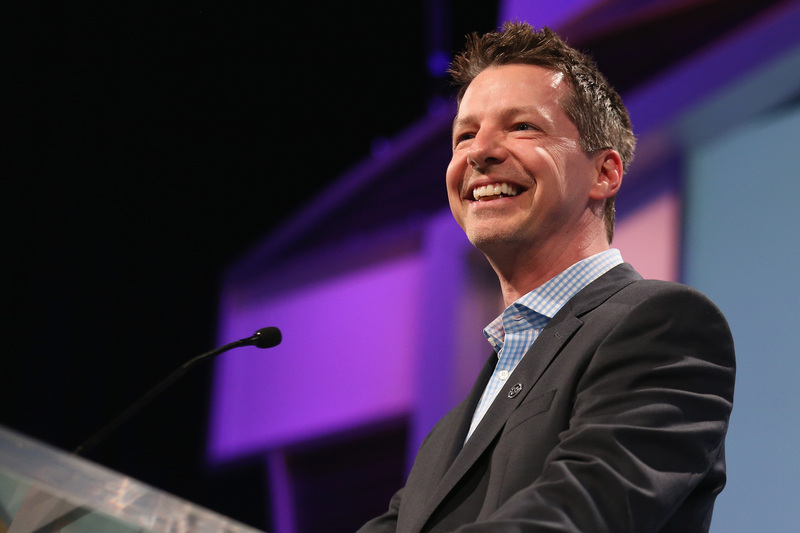 And Sean Hayes has plenty of past roles that he can draw on to develop the perfect upbeat Christmas elf impression. Jack from Will & Grace is basically a Christmas elf already. He's overjoyed at the slightest provocation, he's exuberant, and I feel like he'd totally be the elf to invent something and have it go horribly wrong. Of course, Jack was always more lazy and easily distracted than he was ambitious, but he'd also break out into song and hope everything will be OK… just like Edison Elf. And it's no surprise that NBC would want to give Sean Hayes a gig like this one, because he's worked consistently for the network since the Will & Grace days. Hayes is an executive producer on Grimm and Hollywood Game Night , and briefly tried to rekindle the three-camera format for them with Sean Saves the World. Lest you think that all Sean Hayes does is work in sitcoms, you're mistaken. He's done plenty of voiceover work. He was one of the two-headed twins in Monsters University, and before that, also gave his voice to the Cats & Dogs films, did a guest spot on American Dad!, and even played this fish in The Cat and the Hat adaptation, which while a terrible movie, does give him experience adapting beloved children's book characters. Hayes has been on Broadway in Promises, Promises and Damn Yankees. Since How Murray Saved Christmas is actually a musical, with original songs by writer Mike Reiss and Walter Murphy, a musician who's worked on Family Guy and Ted, that experience is the final thing that will help Hayes bring Edison Elf to life!